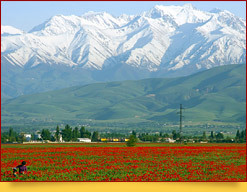 Kyrgyzstan, a fabulous Central Asian country, is very popular with tourists and still shows great tourism potential. It has a long and eventful history and boasts a number of unique heritage sites dating from various times, including the era of the Silk Road caravan tracks, which once ran though its today’s territory; and it is of course a country of fascinating natural sites, a grandiose mountain kingdom often referred to as “Central Asian Switzerland”. 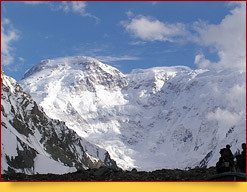 The Tien Shan system of mountain ranges covers 80% of its area, featuring the extremely high mountains Pobeda Peak (7,439m), Lenin Peak (7,134m) and Khan-Tengri Peak (6,995m). Lovers of mountaineering, trekking, downhill skiing, snowboarding and other adventure tourism activities regard Kyrgyzstan as one of the world’s best vacation destinations. Kyrgyzstan’s Issyk-Kul Lake, the world’s second largest mountain lake (after Titicaca in the Andes), makes the country a wonderful beach resort destination as well. 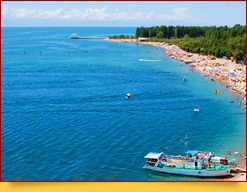 Issyk-Kul’s turquoise waters, wonderful beaches, numerous recreation and health centers and spas are always a guarantee of a perfect summer vacation. 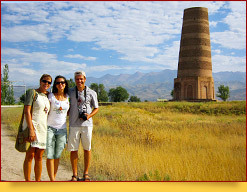 Bishkek and Osh, the major cities of the country, are also worth visiting. They are different in many aspects but both have something a tourist will certainly enjoy. Once in Kyrgyzstan, tourists also enjoy the intrinsic hospitality of the local people, exotic Kyrgyz cuisine and most interesting local traditions carefully preserved and practiced. Kyrgyzstan is a landlocked country in the northeast of the former Soviet Central Asia. It borders China, Kazakhstan, Tajikistan and Uzbekistan. Most of the territory is covered with the Tien Shan mountain ranges. The country’s highest mountain is Pobeda Peak (7,439m; “Victory Peak” in Russian; Kyrgyz: Jengish Chokusu); the lowest parts lie at an altitude of about 400 meters. The area is 199,900 square kilometers - five times as large as Switzerland. The country’s population is a little over 5.6 million. Since life is hard in the mountains, most of the people live in the valleys. The largest ethnic group are Kyrgyz. They make up 72% of the population (2013 estimate) and are spread throughout the country. The largest ethnic minorities are Uzbeks (14.5%) concentrated in the south and Russians (9.0%) living mainly in the north. There are also Dungans (1.9%), Uighurs (1.1%), Tajiks (1.1%), Kazakhs (0.7%), Ukrainians (0.5%) and other smaller ethnic minorities, including Germans. 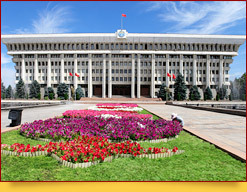 Kyrgyzstan is a parliamentary republic. The parliament, Jogorku Kengesh (“Supreme Council’), is unicameral, with 120 seats elected by popular vote for five-year terms. The president is elected by popular vote for only one six-year term. The country has seven provinces (Batken, Jalal-Abad, Issyk-Kul, Naryn, Osh, Talas, and Chuy), two cities each equal to a province (Bishkek and Osh) and 40 districts in the provinces. There are 22 cities and 429 rural administrative offices. The capital and the largest city is Bishkek, formerly known as Pishpek and Frunze, with a population of 874,400. The official languages are Kyrgyz and Russian. Uzbek and Tajik are also widely spoken. Russian is used as the lingua franca. There are about 30,000 second-language English speakers in the country. 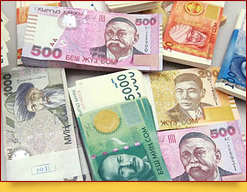 The currency used in Kyrgyzstan is the som (KGS). One som has 100 tyiyns. Banks and currency exchange offices are available in all the cities. One US dollar is equal to about 48 soms (2013 rate). Eighty percent of the population professes Islam (Sunni). Around 17% (mainly ethnic Russians and Ukrainians) follow Russian Orthodox Christianity, and 3% are adherents of other religions. The country’s terrain and location will allow for experiencing almost all types of climate: seaside, subtropical, temperate, dry continental, and even subpolar. The temperatures vary as to region. 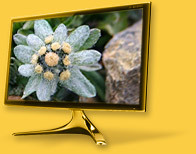 In winter, it is around -8°C in the lowlands and around -27°C in the mountains. In summer, however, the temperature is almost the same in the highlands and lowlands - it is around +26°C, with up to +40°C around the southern city of Osh, Fergana Valley, and -10°C around the highest mountain peaks. The temperatures around Issyk-Kul Lake do not vary significantly by season and are quite comfortable: it is around +2°C in winter (The lake does not freeze in winter, which even its name meaning “hot lake” is indicative of.) and +18-25°C in summer. The precipitation varies from 2,000mm per year in the mountains to around 100mm per year on the west bank of Issyk-Kul Lake. The air in the country is mainly dry. The yearly number of sunny days is quite large - it is 247. The best summer clothes to wear in the country will be T-shirts, light shirts, light and loose trousers, shorts, or sundresses. Clothes made of cotton, or having most of cotton, will feel ideal - cotton breathes and absorbs sweat better than synthetics. Do not forget that white garments will take less solar heat. However, the humidity is low in Kyrgyzstan, so high temperatures are quite bearable unless you are in the south of the country in mid-summer. Remember that your footwear must be comfortable, light and strong, since you will have to walk over rough ground surfaces at times. Light sandals will be great to wear in the cities. Sunglasses, light headwear and sunblock lotion should also be kept handy in summer. There are no dressing style limits in the local culture. However, while visiting religious sites, women should wear loose garments covering most of their arms and legs, and of course the cleavage. Headscarves will also be advisable to put on. Note that you will have to take off your shoes while entering traditional Kyrgyz homes and some of the sacred places where people pray. If you are planning to go to the mountains, it is quite another dressing issue. Note that it is much colder in the mountains in summer, especially at nighttime, and the weather is rather changeable up there. Although you can sample Uzbek, Russian, Uighur, Dungan and other dishes in almost every part of modern Kyrgyzstan, the Kyrgyz, of course, have their own traditional cuisine. However, influenced by the nomadic past of the people, their menu is not so diverse as the ones of the peoples with sedentary heritage. There are no Kyrgyz chicken recipes, for instance, for growing poultry would have required sedentariness, but there are many traditional Kyrgyz cattle meat dishes cooked to preserve them for a long time. Among the traditional Kyrgyz recipes stand out various horsemeat sausages. Chuchuk is probably the most outstanding of them. It is a high-fat horsemeat smoked sausage with a piquant taste. They use horsemeat for cooking a variety of other dishes, such as karyn, which is cold horse stomach slices. 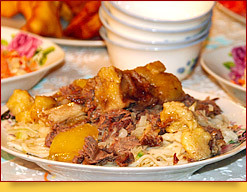 Very popular is beshbarmak (also spelled as beshbarmaq) - boiled and shredded meat with noodles in broth. The Kyrgyz have long been cooking Uzbek, Tajik, Uighur and other neighboring peoples’ signature dishes, such as pilaf, laghman noodles (in gravy with meat pieces and vegetables), manti and chuchpara (chuchvara) dumplings. Since the times of the Great Silk Road Central Asian nomadic and sedentary cultures, including cuisines, have always been mixing up, complementing each other. The local people very much love and often eat honey. Honey with local flatbreads is a common morning meal in the country. There are a lot of most delicious fruits in Kyrgyzstan in summer and autumn. The apples from Issyk-Kul Lake orchards, for instance, rank among of the world’s best. When it comes to vegetables, the Kyrgyz like pumpkin very much. What Kyrgyz cuisine is also notable for is a wide variety of fizzy fermented milk and cereal beverages. First, it is kymyz, fermented mare’s milk, slightly alcoholic - the signature drink of Eurasian nomads. Very popular in the country is maksym - grounded grains, water or milk, flour, all fermented. Ayran - a mixture of fermented milk, salt and water - is also very common in Kyrgyzstan. Jarma, like maksym, is made from ground grains and mixed with ayran. Chalap is similar to ayran, and is known as Tan in the market. All these beverages are made almost everywhere in Kyrgyzstan. You can buy them from the local bazaars, stores and even at the roadsides. Traditionally, Kyrgyz families have their meals at a dasturkhan - a large cloth spread on the floor. If you visit a Kyrgyz home, invited to dinner, you must take the food with the right hand and put your legs away from the dasturkhan. Try not to sneeze, if you can. They do not think doing so while having meals is appropriate either. Generally, the menus in Kyrgyzstan’s cafes and restaurants are never expensive. A lunch and a dinner, for instance, will cost around 10 USD and 20 USD respectively. However, in the capital, there is a number of luxury restaurants where you will have to pay over 10 USD for a cup of coffee. Most cafes and restaurants in Kyrgyzstan have traditional Kyrgyz, Uzbek, Uighur and Russian menus. Nationals of Armenia, Azerbaijan, Belarus, Cuba, Georgia, Japan, Kazakhstan, Moldova, North Korea, Russia, Tajikistan, and Vietnam are allowed visa-free stays in Kyrgyzstan for an unlimited period of time. Nationals of Mongolia and Ukraine are allowed visa-free stays in the country for a maximum period of 30 days. Nationals of Malaysia and Turkey can stay visa-free in the country for a maximum period of 30 days. Since August 2012, nationals of another 45 countries have been allowed visa-free stays in Kyrgyzstan for a maximum period of 60 days. You can see the list of these countries here. Nationals of a number of other countries can get Kyrgyz entry visas through a facilitated procedure, quite easily and quickly. If you are planning to visit a border guard zone in Kyrgyzstan, you will have to obtain a special pass to enter it. While checking out of a hotel in the country, make sure that they have given you a certificate stating the period of your stay in the hotel. You may have to show them to the border guard officials while leaving Kyrgyzstan. When you are in the country, watch your personal effects (at the airports, railway stations, bazaars and other crowded places). If you find there is no reliable storage facilities you can use, keep your documents, valuables, bankcards and cash with yourself. Do not visit deserted areas, especially when it is dark. If you have to take a medicine, it is better if you to bring it with you, or ask our tour organizers if it is possible to buy this medicine in Kyrgyzstan. If you are planning an ascent of a mountain or other adventure activities in Kyrgyzstan, you will have to obtain an insurance policy for 30,000 USD in your home country. According to the customs regulations of Kyrgyzstan, bringing into the country firearms, ammunition, narcotics and printed material with the content threatening the state’s constitutional system is prohibited. Regardless of citizenship, a person can bring in as much cash as they can, on condition that the sum they can take out of the country must not exceed the sum they brought in as per their arrival customs declaration (to be kept till their departure from the country). You can bring into the country valuables, devices and equipment that are worth 5,000 USD at the most, and such objects are to be listed in the arrival customs declaration as well. If you do not have any of them as per your arrival customs declaration while leaving the country, you will have to pay an import duty on such “missing” objects. You are allowed to bring into the country 1,000 cigarettes, 2 liters of wine and 1.5 liters of strong alcoholic drinks at the most. The quantity of cosmetics allowed to bring in cannot exceed one adequate for your personal use. The national currency of Kyrgyzstan is the som (KGS; also transliterated as sum, soum). The values of the banknotes used currently are 1, 5, 10, 20, 50, 100, 200, 500, 1000, and 5000. All the transactions in the country must be conducted in soms. You can exchange your money in the local banks, which are open mainly from 9.00 to 17.00 except weekends, and official currency exchange offices, some of which work round the clock. Note that the exchange rates may differ slightly as to location, and the rate in the capital is always better than outside it. Note also that they may not accept badly worn or old banknotes, as well as banknotes with defects, bad folds and scribbles. We do not recommend that you exchange money through individual exchange dealers at the bazaars: there is a risk of falling prey to cheaters or be arrested red-handed if you go for their illegal services. International banks cards are accepted only in some hotels, banks and shopping centers in Bishkek. In Kyrgyzstan, people are allowed to photograph and video almost anything except for airports and military facilities. If you want to photograph or video strangers, especially close up, you should do so with their permission. 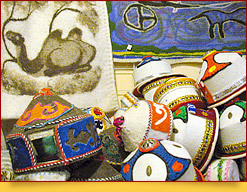 You will most probably want to buy some traditional Kyrghyz handicrafts - as memory tokens or gifts for friends. Besides handmade carpets and rugs, as well as wooden objects decorated with carvings, which are quite widespread in Central Asian countries, they make impressive felt items in Kyrgyzstan - also part of the country’s nomadic past heritage. Standing out among them are a wide variety of scale models of traditional Kyrgyz yurts (collapsible dwelling structures of Asian nomads), teapot covers, traditional felt hats, toys, and felt slippers. A set of traditional Kyrgyz drinking bowls with characteristic designs will also be a great thing to buy. • 31st August - Independence Day. The Country’s Symbols And Ensignea: flag, national anthem, coat of arms. Description: The National Flag of the Republic of Kyrgyzstan is a red-colour width (strip) of cloth, in the centre of which a round solar disk with forty evenly diverging rays of golden colour is placed. Within the solar disk, a “tunduk” - an upper part of a Kyrgyz yurt (the nomad"s foldable felt round tent) of red - is depicted. The monochromic red colour of the Flag symbolizes valour and courage; the gilded Sun bathing in its own rays embodies peace and wealth; the tunduk is a symbol of ancestral home and, in more broad terms - a symbol of the world as a Universe. 40 rays bundled in a circle symbolize unity of the 40 Kyrgyz ancient tribes. Tunduk symbolizes unity of people of different nationalities living in Kyrgyzstan. Red colour of the National Flag is also a colour of the flag of the Kyrgyz legendary hero - noble-minded knight Manas. The Flag has been approved by the Supreme Soviet of the Republic of Kyrgyzstan on 13th March, 1992. Description: On the Coat of Arms, the Manas’s own falcon spreading-out its wings is depicted to symbolize the Liberty of the country. Also depicted is notorious “Purl of Kyrgyzstan” - the Issyk-Kul Lake surrounded by high rocky Ala Too mountains. The sun-lit white mountain summits are a matter of genuine pride of Kyrgyz people, the pride for beauty of their native land. The outlines of the mountains resemble that of the white “kolpak” (hat) - traditional Kyrgyz male headdress. 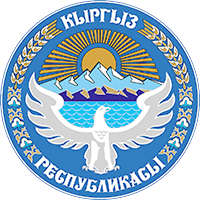 The Coat of Arms has been approved on 14th January, 1994 by the Resolution of the Zhogorku Kenesh (parliament) of Kyrgyzstan. That is our native, sacred and dearest land. And they always were reverently preserving our native land. On the way of Liberty, onward you go! Your own fortune to create! Unity and friendship our people in their hearts keep. With rays of concord and harmony you are lighted. The daydreams and hopes of our forefathers came true. And the Banner of Liberty raises high into the air. For the sake of welfare of people. Kyrgyzstan country code is +996. If you want to phone somebody in Kyrgyzstan from outside the country, you will have to dial the international exit code of the country you are in, add 996, Kyrgyzstan area code / mobile network operator code and subscriber’s number.